Home Features Destinations The Most Boat-Friendly City in Ontario? 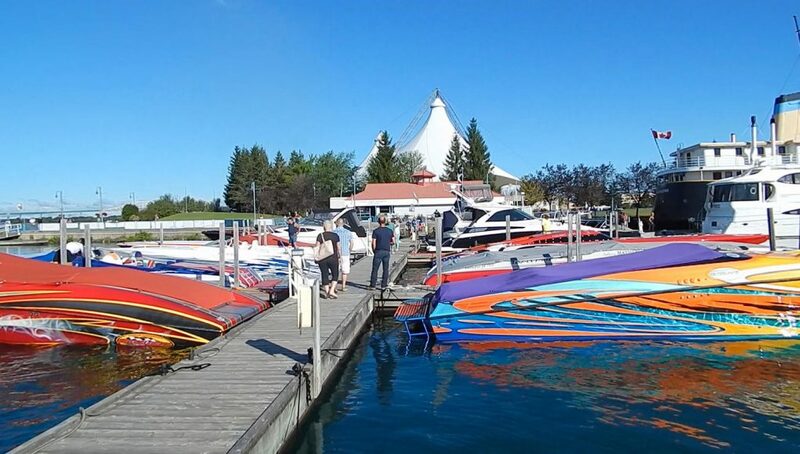 If you gave a boater a blank canvas and asked them to design the perfect boating destination, with all of the amenities they need within a kilometre of the marina, plenty of attractions and breathtaking scenery, don’t be surprised if their final result looks a lot like Sault Ste Marie, Ontario. Located on the St. Mary’s River, between Lake Huron and Lake Superior, the city of Sault Ste Marie is the must-see destination for anyone enjoying the spectacular boating on the North Channel. Sault Ste Marie has not only an abundance of attractions to visit, places to shop and hospitality establishments to enjoy, but most are within a very short walking distance from the downtown marina. Everything starts with the Roberta Bondar Marina. Named after the famous Canadian astronaut Dr. Roberta Bondar, this 38-slip facility is specifically for transient boaters. Transient docking can sometimes be at a premium in most cities. Too often the slips are filled with seasonal tenants and it can be frustrating when you’re arriving for a night or two and see a marina full of boats, but all closed up and not a soul in sight. Having a marina dedicated specifically for boaters who want to enjoy what the city has to offer and then move on is a fantastic idea. The marina has 450 feet of dock space. Both gas and diesel fuel, as well as pump-outs, power and water hookups. There are showers and laundry available and the store offers ice, charts and other necessary supplies. The marina also serves as a Canadian Customs point of entry to make visiting the town more convenient for foreign flagged vessels. But it’s the location of the marina that’s its best feature. Let’s say you arrive in port and need to stock up on provisions for the next leg of your voyage. There’s no taxi involved. No need to take any sort of transit. The Station Mall is only 500 meters from your boat. You’ve got over 130 stores to choose from, including Walmart, with a full grocery department, and Sears. Not only is the mall great for provisions but, should the weather turn less-than-ideal for boating, it provides a fantastic place to spend a rainy afternoon. The mall is also home to a Galaxy Cinemas movie theatre. If a shopping mall doesn’t quite fit your idea of exciting entertainment, another short 500-meter walk will bring you to the front doors of the OLG Casino and Slots. This entertainment venue offers dining and live entertainment, along with an assortment of slots machines and table games. Just south of the casino, you’ll find the Mill Market. Open on Wednesday afternoons and weekends until early afternoon, this indoor/outdoor market offers a great selection of local produce, meats, arts and crafts along with live entertainment and educational classes. If your choice of entertainment leans more towards the arts or history, you’ll want to leave the marina and head east, away from the shopping mall. Within one kilometre you’ll find two excellent attractions. The first is the Art Gallery of Algoma. In addition to its selection of artwork and sculptures, the gallery offers many different art classes and most are included free with general admission. Stop by and check out some of the work by Dr. Roberta Bondar and other artists in the gallery’s permanent exhibits. A bit further on you’ll find one of the highlight attractions in Sault Ste Marie, the Canadian Bushplane Heritage Centre. Housed in a former Ontario Provincial Air Services hangar on the bank of the St. Mary’s River, this facility offers an in-depth look at the vital role bush planes provide in servicing the northern communities. This is a great venue to visit if you have kids along for the trip. The centre features a hands-on exhibition that teaches how airplanes work. You’ll also have a chance to see aircraft being restored, take a trip in a flight simulator; experience the dangers of aerial forest fire fighting in a 3D adventure and climb a real fire tower. After a long day of exploring the incredible selection of attractions, you’ll quite likely be in the mood for a relaxing dinner. I would strongly suggest you stroll over to the Delta Hotel and check out The View Restaurant. The food is fantastic, the service is first-rate and the view of the boardwalk and waterfront is spectacular. For an even better view, the restaurant has an excellent outdoor patio. Before you leave town, there is one more attraction you need to visit. I left it until the end because if your journey is taking you north, into the deep waters of Lake Superior, then you’ll have to transit through the Soo Locks anyway. If Sault Ste Marie is the furthest point north on your voyage, I would encourage you to go a little bit further and transit the locks. The park around the canal is wonderful. There is a lot of history to experience. This lock was originally built in 1895 and was the longest lock in the world at the time. It closed in 1987 due to structural damage but reopened in 1998 for recreational use. The area has been declared a National Historic Site and there’s no better place in Sault Ste Marie to spend a sunny, summer afternoon. I’ve visited a lot of waterfront communities. In fact, I’ve been to every one on the shores of Georgian Bay and Lake Huron, from Sarnia to Sault Ste Marie, and I am absolutely convinced there is no better place for a boater to visit than the Soo. Not only does Sault Ste Marie offer every amenity a boater could need or want, but the incredible proximity of it all to the waterfront in combination with the beautiful scenery and rich history, takes this community to a whole new level as a premium boating destination. This article was originally published for Ontario Tourism.